The Butterfly Coloring Kite is a must have! These kites are easily recognizable with their classic diamond shape and printed fabric tails. Now, however, you can show off their artistic skills by coloring or painting their own design! Crayons are included so customers can get started with their creation right away; however, fabric markers or paint can be used as well. 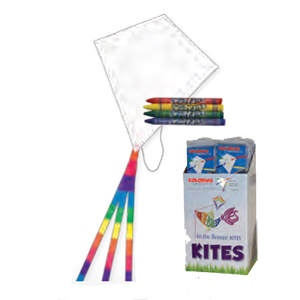 These single line kites are great for the novice to intermediate kite enthusiast which make them great party favors or craft projects. The Coloring Kite is available in a sled kite as well! Made with white ripstop fabric and fiberglass rods.